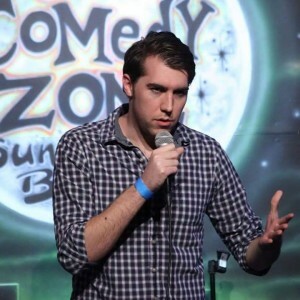 Hailing from Western Pennsylvania, Dan arrived on the South Florida comedy scene in 2014 and has been treating audiences to his unique brand of clever, dry and occasionally dark humor ever since. Recently, Dan was named a Florida’s Funniest Semi-Finalist, hosted at Homefield Comedy Club and is a producer/host of Comedy Night at American Rock Bar. I always enjoyed watching it. I even spent some time at the computer lab watching YouTube clips rather than going to class. I got my first taste of it at a Club at Penn State University called 2nd Floor Stand-up. It’s a weekly get together (similar to a meetup)…We would watch each other perform, critique each other & I eventually got on their monthly lineup. 2. Who are you favorite comics to watch. My favorite local comics to watch are John Gregory, Tim Hanlon, John Hyne, Mike Atcherson and of course Minda Mo. JFK, I would take him to a helmet store and buy him a helmet so that he would get better protected when we go out to lunch. Tim Robbins from the Shawshank Redemption, because he is tall and ruggedly handsome. I don’t like waiting around…the anticipation of getting when I am going to get on stage. Especially when you are down on the list at the open mic. Foods that I don’t have to cook. 7. How is the PA/Miami Comedy scene different? There is a lot more down here however you have to be cleaner. I was able to get away with more racial, edgier and darker material up in Pennsylvania. Don’t be afraid to look stupid, because it takes a while. Try a lot of stuff and find a girlfriend in comedy…it will help with the open mic wait time. 9. Why should people check out the American Rock Bar? It is a great setup for stand-up since it’s closed off from the rest of the bar. We are able to recruit talent from both Orlando & Miami plus we have some solid acts coming in such as Myq Kaplan this Saturday night. There are so many things. There is too many to name (We couldn’t complete the answer to this question due to time constraints as Dan was about to go jet-ski paintball).